In 37 straight surveys conducted over the course of 21 years by the Gallup polling company, a majority of Americans have said that abortion should be illegal in all circumstances or in all but a few circumstances. In the most recent survey, conducted May 6-10, a combined 55 percent of respondents said abortion should be illegal in all circumstances or in all but a few circumstances. Specifically, 29 percent said abortion should be legal “under any circumstances,” 13 percent said it should be legal “under most circumstances,” 36 percent said it should be "legal only in a few circumstances,” and 19 percent said it should be illegal “in all circumstances.” Two percent said they had no opinion. The 36 percent who said it should be legal in “only a few circumstances” and the 19 percent who said it should be illegal “in all circumstances” equaled 55 percent of all those surveyed. In a data sheet released with the May 6-10 survey, Gallup provided the results for this question in 37 surveys it has conducted dating back to September 1994. In every one of these surveys, the combined percentage of respondents who said abortion should be illegal “in all circumstances” or in all but “a few circumstances” exceeded 50 percent of those surveyed. The lowest these combined answers have ever been was 51 percent—the level it was at in September 1994, the date of Gallup’s first data on the combined answers, and September 1995, the date of the third survey with data on the combined answers. In the past 20 years, the percentage who say abortion should be illegal in all circumstances or all but a few circumstances has never dropped below 54 percent. 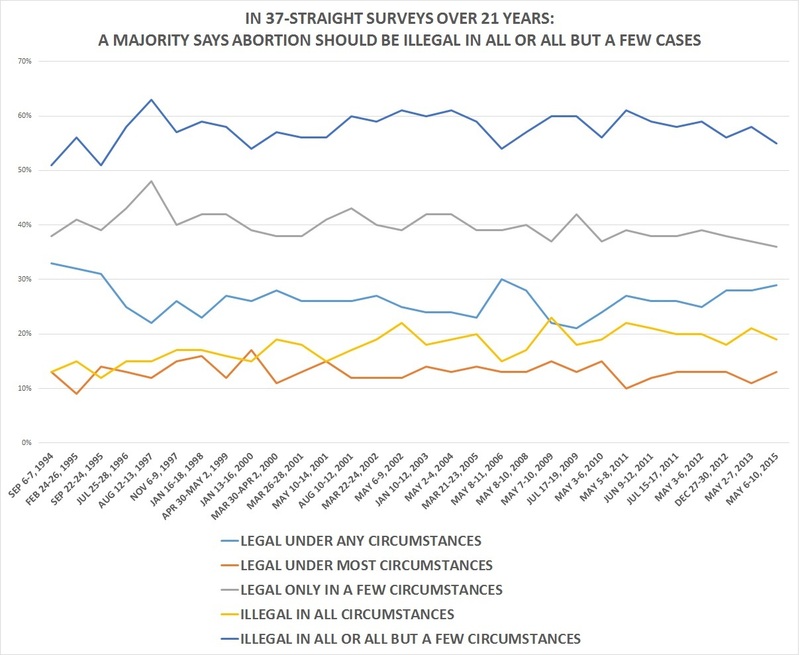 In its data sheet for the May 6-10 version of the survey, Gallup included an historical breakdown of the answers to this question and the follow-up question, putting respondents’ abortion views in five categories: “legal under any circumstances,” “legal under most circumstances,” “legal only in a few circumstances,” “illegal in all circumstances,” and “no opinion.” The data sheet includes this five-category breakdown for 37 separate surveys, dating from Sept. 6-7, 1994 through May 6-10, 2015. By contrast, Gallup also asked respondents this question: “With respect to the abortion issue, would you consider yourself to be pro-choice or pro-life?” In the first survey reported with this question—which was conducted Sept. 22-24, 1995—56 percent described themselves as pro-choice, 33 percent described themselves as pro-life, 5 percent said they were mixed or neither, 3 percent said they did not know what the terms mean, and 3 percent had no opinion. In the latest survey conducted May 6- 10, 50 percent described themselves as pro-choice, 44 percent described themselves as pro-life, 3 percent said they were mixed or neither, 2 percent said they did not know what the terms mean and 1 percent said they had no opinion. In its analysis of the latest survey, Gallup reported on what self-described “pro-choice” and “pro-life” people say on the question of when abortion should be legal or illegal. According to the survey, many “pro-choice” people believe abortion should be mostly illegal, while a few “pro-life” people think it should be mostly legal. Specifically, according to Gallup, 4 percent of people who described themselves as “pro-life” said abortion should be legal under any circumstances and 5 percent said it should be legal in most circumstances. Thus, 9 percent of self-described “pro-life” people think abortion should be legal in most or all circumstances. On the other side, 23 percent of self-described “pro-choice” people said abortion should be legal “in only a few circumstances” and 4 percent said it should be illegal “in all circumstances. Thus, 27 percent of self-described “pro-choice” Americans think abortion should be illegal in all or all but a few circumstances.